Our latest Wurlitzer part! "WEP-OB1" (Wurlitzer electric piano Outlet board 1) $25.00 standalone, or available with our amplifier bundles. Replaces those old and corroded output jacks! Quick and easy solder-less terminal block installation. High quality Amphenol® 1/4" isolating jacks eliminate ground loops and maintain signal integrity. Direct drop-in installation for all 200 and 200A Series Wurlitzer electric pianos. These can also be used for converting Student and Console 203, 206 pianos. CTS Replacement swithced volume pots for 200 and 200A pianos equipped with RetroLinear / Warneck Research amplifiers. New production 200 series knobs- Painstakingly recreated down to every last detail! Features: Tight fitting internal spring, rigid abs knob with durable chrome coating & aluminum insert/scrim. Each replacement amplifier board is designed to reproduce the sound and characteristics of the original Model 200 amplifier - only without all the noise. The new amp employs low noise circuit and layout techniques. When installed with the included reed bar shields to minimize 60Hz hum, the performance is unmatched. It even outperforms fully restored 200A amplifiers! Terminal blocks allow easy installation without the need to solder. Features include exact reproduction of the EQ curve and sound shaping characteristics of a properly restored original 200 series amplifier; authentic vibrato; very low noise; an improved power amplifier; user-selectable variable or fixed line-out configuration; drop-in replacement and solder-free installation. Variable Speed Vibrato Upgrade for your Wurlitzer Model 200, 200A, or 140B Piano. 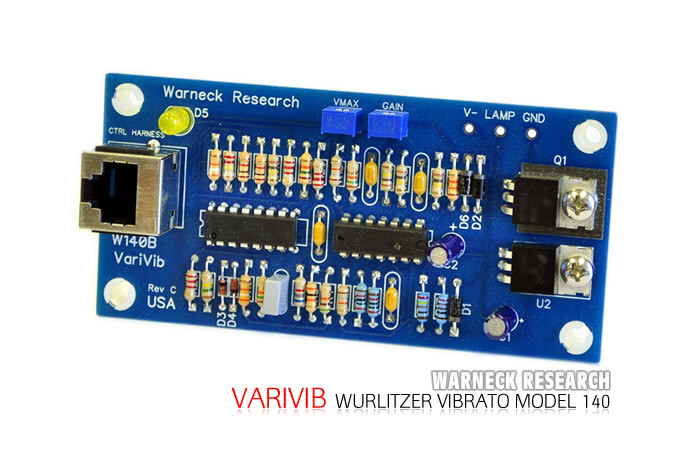 Designed to work with the Warneck Research EP200 & 200a amplifier board as well as with the stock Wurlitzer 200A or 140B amplifiers, the Warneck Research VariVib variable speed vibrato upgrade features exact reproduction of the original style vibrato waveform, linear variable speed control (approximately 1Hz to 15Hz), and simple 3-wire installation! Included with the VariVib are a mounting bracket, new mirror-finish faceplate, and knob. 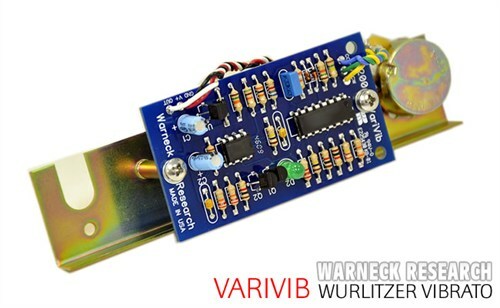 The VariVib extends the expressive range of your Wurlitzer piano with variable speed vibrato, easily adjusted with knob control. Mirror finish aluminum 3 hole faceplate for the Varivib. We offer all of our products at a discount to dealers as well! Take your restorations & projects to the next level. Forgot to mention. We're also offering these at Dealer Pricing so if your a repair shop and want to get the Best reeds on the market for your vintage wurli's shoot us a call!!! A few updates going on here at the shop! We have parts for purchase on the site under the web store / wuriltzer parts section. Does the Retrolinear Warneck amp include the preamp board as an all in one board? OR Is it normal to replace the preamp board as well when adding the Warneck board for amp/his/buzz problems? Hope you can clarify.Thanks for your help. The WR amp boards replace all internal electronics minus the transformer, pots, jacks etc. The small preamp board is no longer required with the installation. We are working on installation videos, keep an eye out for them on our website & youtube channel. 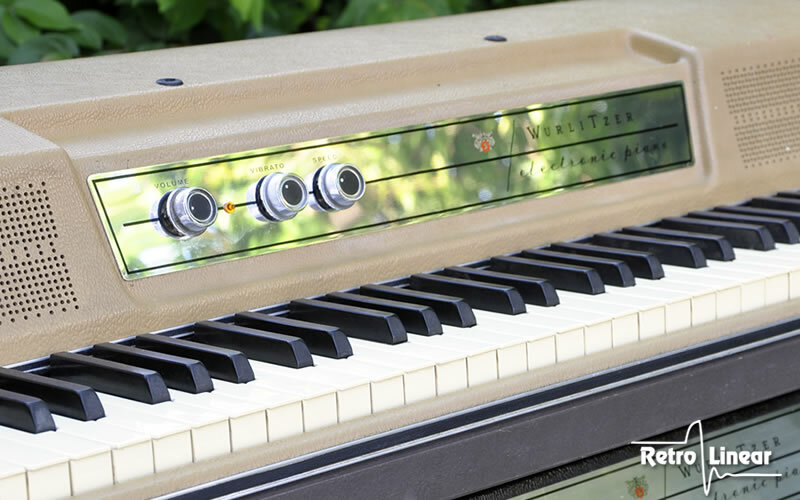 Re: RetroLinear Wurlitzer Parts: Updated July-2018!! !